Cleaning shower doors can be a pain. They get spotty with water and scummy with soap with normal use. If you use different kinds of soap, you can even have different kinds of scummy layers. But when it comes to cleaning your bathroom, cleaning the doors to your shower is as much about aesthetically pleasing as it is cleanliness. When you are cleaning the bathroom, cleaning the shower doors is likely not one of your favorite tasks. Even with most over the counter products, glass doors take a lot of scrubbing to avoid streaking and you have to start at the top and work your way down. Glass cleaners alone do not remove the soap scum while soap scum cleaners that work great on tile can leave a filmy residue on your glass. When it comes to choosing a product, you have a wide selection of cleaning items at home that just might do the trick. If you are frustrated with store bought remedies, a few homemade solutions might be just what you need to get your shower doors sparkling clean. Standard, white toothpaste (avoid green, blue or red versions) with whitening products in them (typically baking soda and hydrogen peroxide) and a sponge/scotch pad combination are handy items when it comes to cleaning the soap scum. Dampen the sponge with warm water and use whitening toothpaste in small nickel sized amounts. Scrub the glass gently with the scotch pad side of the sponge. Start at the top and work in rotating motions to loosen the soap scum. The hydrogen peroxide and baking soda will eat through the scum, loosening it and allow you to rinse it away with the sponge side of the pad. Stick with warm water rinsing as you go and working your way down the door. The combination of scrubbing and rinsing should leave you with clear, streak free doors with no water spots or scummy residue. Baby oil is another solution to scummy glass doors and walls in your shower. When working with baby oil, be sure to rinse thoroughly from the floor to avoid slippage later. You begin with a scotch pad sponge and apply the baby oil in smooth circular motions starting at the top of the door and working your way down. It will look terrible at first, but put a full coat of baby oil on the door with the green scrubbing side. Now take a vinegar soaked cloth (you probably want to wear dishwashing gloves for this) and wipe down the doors. The vinegar will cut right through the oil, oil coated dirt, and pull it free. You can rinse with water when you are done and then wipe it down once more with a vinegar based spritz for a clean, streak free shine. Another option for cleaning your shower doors may be found in a bottle of windshield cleaner. Windshields need to stay clean regardless of what is in the rain, the dirt kicked up from the road and other contaminants. Most automotive stores will carry a windshield treatment product like RainOff and more. These products not only clean, but also are designed to create a protective barrier on the glass to help repel water, bugs, and dirt. Crud cleaning products like Krud Kutter offer another useful way to clean the glass on your shower doors. 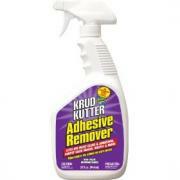 Most Krud Kutter products are safe for use around animals, plants and children. You can use it on the bathtub, shower doors, walls and floor. The cleaner cuts through the crud and helps to put a protective barrier that reduces how much scum and dirt clings to it, similar to the windshield cleaners. The less dirt and scum that sticks, the less you have to clean. Clean shower doors make your morning shower a pleasant place to be. Take time to give the doors a thorough cleaning once a week, and you'll never have to deal with excessive soapy buildup again.